-Lingcod were caught from 7 geographically distinct regions in the US West Coast: Southern CA, Central CA, Northern CA, Oregon, Washington, Puget Sound, and Southeast Alaska. -300 fish were caught from each region = 2100 fish total! -My study was to look at Lingcod growth and maturity rates from these areas to see if there was a gradient as you moved from North to South. This is my actual data for all regions combined. We can see that coastwide, females clearly get to a larger maximum size (~85 cm or 33 inches) compared to males (~65cm or 25 inches). Comparing all regions (except Puget Sound and Alaska, which have NOT been aged yet) I did find that growth rates were different among some regions. Lingcod in Oregon and Northern California were found to grow larger and faster than lingcod in Central and Southern California. 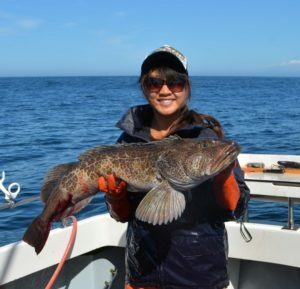 -Comparing size at maturity, I found that there was a latitudinal gradient in sizes, where lingcod in Northern regions (Alaska, Washington) mature at larger sizes than lingcod in Southern regions. 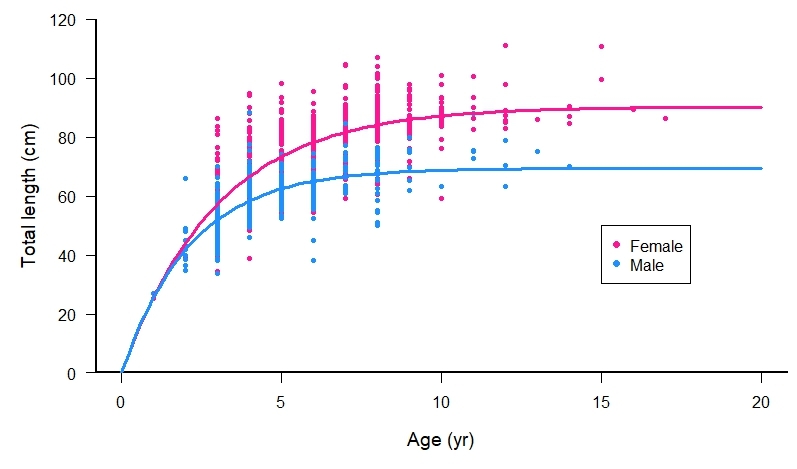 There was a very steady gradient in this relationship: As latitude increased, size at maturity also increased. So, the point of my research is to investigate whether having smaller management areas would be beneficial for the lingcod (or other bottomfish) fishery. Discovering that lingcod growth and maturity in Northern California is more similar to that of Oregon’s lingcod stock versus Central or Southern California’s is an indication that maybe California stocks can be split up into different management areas, and potentially have different regulations (bag limits, size limits). The goal of my project isn’t trying to implement immediate regulatory changes or anything, it’s more focused on the broader potential of having smaller, more regional management zones for any species that might have varying life history traits (growth, maturity, mortality). Luckily, lingcod are great to study because they grow so quickly (compared to some rockfish species).